Giatex employs its award winning and patented Stretching Frame Technology to provide higher stability and greater riding comfort than other folding bicycles on the market. This system developed by Giatex is the first of its kind in the world. The stretching frame design allows the front section of the frame to slide through the rear frame, bringing the front wheel closer to the rear wheel. This allows the bike to be adjusted to suit riders of varying height and to be tuned to the riders individual comfort levels. 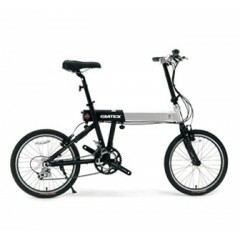 Because the frame tubes are not cut in half like other typical folding bikes, it means the Giatex frame provides a very stable and sturdy ride. In fact many riders have commented that the bike feels like a 'normal' bike! After years of testing the bikes in Australian conditions, it's a sentiment we couldn't agree with more.